These systems can raise an alarm or trigger a pager a short distance away, within the range of an average house or garden. Thus they may alert a carer or relative that you require help. 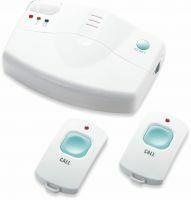 They are triggered when you press a personal alarm button, some can also be triggered by sensors such as a fire alarm. The receiving unit is not portable, consequently it needs to be located in a position where it is most likely to be heard by your carer or relative.